* Please note: Council has installed ReadSpeaker technology to make our website more accessible for people with a vision impairment. We are working towards making all our forms on this site accessible. If you have trouble accessing anything on this website, please contact our Community Engagement team on 1300 87 83 87. Council is working towards a Lismore that is accessible and inclusive for everyone and provides equal opportunity for people living with a disability to utilise and enjoy public spaces and fully participate in public life. Under the NSW Disability Inclusion Act 2014, Council is required to undertake disability inclusion action planning and have an adopted plan in place. We have worked with other Northern Rivers councils and the local disability sector to inform our Disability Inclusion Action Plan. Additionally, we conducted extensive community consultation within the Lismore Local Government Area (LGA) to ensure that we considered all the issues. Developing positive community attitudes and behaviours towards people living with a disability. Creating liveable communities for everyone. Supporting access to meaningful employment. Improving access to mainstream services through appropriate systems and processes. Disability inclusion action planning is positioned as a part of Council’s core business and is embedded within Council’s four-year Integrated Planning and Reporting (IP&R) cycle. Community consultation for the next plan will commence in 2019. Please contact the Partnering & Community Engagement team on 1300 87 83 87 if you would like to be involved in this process. Council has a Disability Access and Inclusion Advisory Group (previously known as the Access and Inclusion Committee). Provide advice on the implementation of Council’s Disability Inclusion Action Plan 2017-2020. Provide input and advice to Council relating to the strategies in the Imagine Lismore Community Strategic Plan concerning disability access and inclusion. Assist Council with the development of any subsequent disability inclusion action plans. The group meets every second month (six times per year, commencing in February) during business hours in the Lismore CBD. The group has a maximum of 15 members who nominate for the position, are selected by a panel and formally appointed by Council for a period of four years. The current members are appointed until the year 2020. For further information please refer to the Disability Access and Inclusion Advisory Group Terms of Reference. If you would like to know more about the Disability Access and Inclusion Advisory Group or would like to be a guest speaker phone our Partnering & Community Engagement team on 1300 87 83 87. MLAK stands for Master Locksmiths Access Key and is an innovative system that allows people living with a disability to have 24/7 access to elevators, accessible toilets, ‘Changing Places’, national parks and adaptive playground equipment throughout Australia. Council has MLAK keys available for sale at our Corporate Centre at a cost of $5 each. If an MLAK key is lost you will be required to purchase a new one. A letter from your doctor. A letter from your disability support provider. As part of the National Continence Program, the National Toilet Map provides information on over 19,000 publicly available toilets across Australia, including accessibility. This is a useful resource to find out where there are accessible toilets in the Lismore LGA. If you know of an accessible toilet that is not listed please contact our Partnering & Community Engagement team on 1300 87 83 87. Council has produced a Missed Business Guide to highlight how businesses can make their premises more accessible and inclusive to people living with a disability. Business owners may be unaware they are losing business due to poor access and inclusion. The Missed Business Guide details easy and often inexpensive steps you can take to improve your service and potentially your profits. Council in partnership with the Institute of Access Training Australia has produced a free guide to help tradespeople meet disability access specifications. The booklet outlines minimum requirements for renovators, builders and developers to make the built environment more accessible both in homes and the commercial environment. It includes specifications for ramps, pathways, steps, bathrooms, toilets, doors, furniture, fittings, shelves, tables, seating, kitchens and signage. The guide is free and perfect for a tradie’s glovebox or toolbox. View the The Tradies Guide to Good Access or pick up a hard copy from our Corporate Centre. 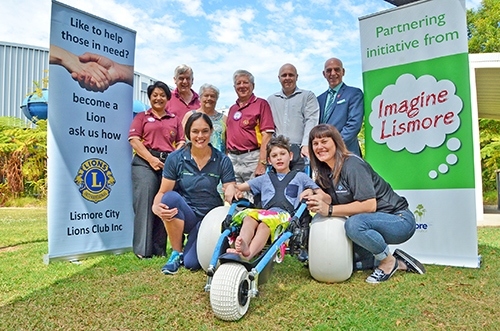 Thanks to the generosity of the Lismore City Lions Club and the Lions Northern NSW Community Trust, an all-terrain beach wheelchair is available to hire for free from the Goonellabah Sports & Aquatic Centre (GSAC). The chair can be used on patrolled beaches or suitable walking tracks and can folded for transportation in a medium-sized vehicle. It can be picked up seven days per week from GSAC at 50 Oliver Avenue, Goonellabah, during operating hours and is available for a 24-hour period. GSAC operating hours change from summer to winter so please check their website before arrival at www.gsac.net.au. To book the chair, phone GSAC on 6625 5370. Bookings are essential and need to be made at least 48 hours in advance. Please note that GSAC is closed on public holidays so please make arrangements when booking of any extension to the 24-hour loan period. You will be required to present photo ID to the staff of GSAC prior to chair hire and will also be required to undertake a quick safety briefing. An individual using the chair is required to be accompanied by a support person at all times and it is highly recommended to be used in environments where it is safe to do so i.e. patrolled beaches and access-friendly walking tracks. All other conditions of use can be found in our Hippocampe Chair Hire Agreement. To see how to correctly use the chair, watch the video Beach Wheelchair Hippocampe in Action. The Pedestrian Access and Mobility Plan (PAMP) is a comprehensive strategy that focuses on creating safe, convenient and accessible pedestrian networks for everyone in the community. The 2011 PAMP is a review of the 2003 document in partnership with Roads and Maritime Services. The PAMP is due for review again between 2019 and 2021.